The name has changed, the colors have changed, the players have changed, but these are still our Metros, as flawed as they are. The first game of the franchise's 11th season almost opened with a roar after two first-half goals, but ended on a down note as DC Scum came back with two of their own to tie the match. 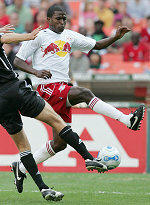 Youri Djorkaeff scored the first Reds goal off a terrific free kick and Edson Buddle became just the tenth player in team history to score on his debut. Metro came out with a 4-4-2 with five starters seeing their first action with the club -- Taylor Graham in central defense, Marvell Wynne at right back, Danny O'Rourke in defensive midfield, Chris Henderson at left wing, and Buddle up top. Two other players, Carlos Mendes and Seth Stammler, lined up in new positions, at left back and right wing respectively. Tony Meola, Jeff Parke, Amado Guevara, and Djorkaeff filled out the rest of the spots. After some early attacks by DC, Metro won a free kick 35 yards from goal in the 15th minute after a foul on Djorkaeff. Youri stepped up and placed the free kick perfectly in the upper left corner to open the scoring. Then, just three minutes later, DC's horrid keeper Troy Perkins failed to hold a Stammler cross, and the ensuing collision with his own defender left the ball up for grabs, with Buddle pouncing on it to double the lead. In scoring, Edson became the first Metro since Mamadou Diallo in 2002 to score in his first regular season game. Metro had the better of the first half, but Meola did have to make a number of big saves to keep the lead. Unfortunately, the insertion of Alecko Eskandarian in the second re-energized the Scum, and he drew DC close in the 55th minute, slamming home a cross. And ten minutes later, what looked like a harmless weak shot from Facundo Erpen went off the leg of Jeff Parke, who had a terrific game otherwise, and into the bottom left corner. Parke had Metro's best chance of the second half, after a free kick from the left side of the DC endline found him in front of an empty half of the net, but the defender one-timed into the side netting. Meola made a terrific save off a free kick on the other end to keep the game tied, and both teams seemed satisfied with the result. Peter Canero made his Reds debut as a late sub. Interestingly, in Mo Johnston's six games in charge, Metro has blown a two-goal lead three times. Who says things are changing? Same old Metro. Lineup: Meola, Mendes, Graham, Parke, Wynne, O'Rourke, Henderson, Stammler, Guevara, Djorkaeff, Buddle. Subs: Canero, Lisi.